// WORKAROUND https://hibernate.atlassian.net/browse/HHH-9663 "Orphan removal does not work for OneToOne relations"
Note that no Dao changes were made, so if, for example, Spring Data was used instead of such a Dao, you wouldn’t have to modify anything else. And you can just remove this workaround code easily when a version of Hibernate because available with HHH-9963 fixed. Finally, yes, this approach does exhibit a bit of code smell (the use of the static variable in this way and the entity having a container managed component aren’t exactly best practices), but, it’s a workaround – hopefully just a temporary one. Since Spring Boot will redirect all non-secure HTTP requests to HTTPS, the health check will see an HTTP 302 redirect and therefore fail. To workaround this issue (and in my opinion, AWS shortcoming), Spring Boot needs to be configured to allow insecure requests to the health check URL. 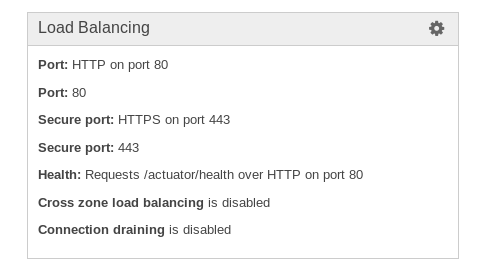 To do so, we’ll define a new URL (/aws-health) that proxies Actuator’s health URL but responds over http and https. Many of the projects I’ve worked on over my career have leveraged a Spring/Hibernate stack. Over that time, the Spring/Hibernate integration has greatly improved making the once tedious and repetitive chore of setting up a new project (and maintaining an existing one through upgrades, expansion, and refactoring) far simpler. Now it’s as simple as going to the Spring Initializr and selecting the right options. In seconds, you get a nicely configured Spring Boot boilerplate and you’re ready for the real work to begin. Well, most of the setup is simple at least… setting up the Hibernate cache is still not simple. To get decent performance on Hibernate, the query cache and/or second level caches are key. But they’re a pain to configure and that configuration is almost entirely redundant with the Spring cache configuration. Spring has a cache abstraction that can back to ehcache, redis, memcache, caffeine, guava, and a variety of other implementations – including just a simple ConcurrentHashMap (which is great for test harnesses). Spring Boot makes it really easy to setup. Instead of setting up the Spring cache and the Hibernate cache totally separately, why not use the same configuration and same implementations for both? That’s what Hibernate SpringCache does. Set up Spring Cache, add the Hibernate SpringCache dependency to your Spring Boot project, tell Hibernate to enable the query cache and/or second level cache, and you’re done. Hopefully, Hibernate itself will one day include this functionality. If you’d like to see Hibernate/Spring integration become that much simpler, let your thoughts be known by commenting on the pull request. Using this approach throughout a project (in controllers, services, etc) can lead to much more readable, shorter code. Spring Data JPA provides a similar feature via DomainClassConverter. In my case, Spring Data wasn’t an option. * but since we don't use Spring Data, we can't use that. // In my opinion, this is probably a bug in Hibernate. // IllegalStateException with the message "No supertype found"
// exactly 1, use the java type of that. WARN [pool-1-thread-1] [ehcache.pool.impl.DefaultSizeOfEngine] sizeOf The configured limit of 100 object references was reached while attempting to calculate the size of the object graph. This can be avoided by adding stop points with @IgnoreSizeOf annotations. Since the CacheManger or Cache elements maxDepthExceededBehavior is set to “abort”, the sizing operation has stopped and the reported cache size is not accurate. If performance degradation is NOT an issue at the configured limit, raise the limit value using the CacheManager or Cache elements maxDepth attribute. For more information, see the Ehcache configuration documentation. To fix this problem, you need to tell ARC what parts of Hibernate objects shouldn’t be counted when calculating object sizes so ARC doesn’t get into an infinite loop (when it hits circular references) or try to calculate the size of the entire Hibernate object graph. One way to solve this problem is to use ehcache-sizeofengine-hibernate. To do so, simply add the jar to your application’s class path and it will be automatically discovered and used by Ehcache. However, since ehcache-sizeofengine-hibernate isn’t in Maven Central, or any publicly accessible Maven repository, it’s not really useful. I requested that it be published to Central a while ago, but the project seems to be unmaintained – so a more maintainable way to solve this problem is required. But you can really do this anywhere (including simply adding “-Dnet.sf.ehcache.sizeof.filter=net.sf.ehcache.sizeof.filter.properties” to the Java command line). Ehcache’s ARC (Automatic Resource Control) is pretty great – it more or less automatically and optimally handles cache sizing/allocation. Using ARC, one can effectively say, “Here’s 2GB to allocate for caching – no more than that – manage the cache as best as possible.” Of course, more complex rules can also be done (on a per cache basis instead of globally, for instance) but that’s the general idea. I’ve used ARC on my last couple of projects to great success. However, it’s not without a bit of complexity. ARC has to calculate the size of objects in the cache to determine how much space is used by the cache, and calculating sizes of Java objects isn’t easy or obvious. Besides difficult to do yet seemingly simple sound tasks as answering “How big is an object reference pointer?” there are object graph traversal problems, and those object graph issues are the ones that I’ve run into a few times in my ARC adventures. To fix this problem, you need to tell ARC what parts of Thymeleaf objects shouldn’t be counted when calculating object sizes so ARC doesn’t get into an infinite loop (when it hits circular references) or try to calculate the size of the entire Spring context. Note that I’ve requested that Thymeleaf make the org.thymeleaf.Template class serializable, which would remove the need to do anything (ARC would “Just Work” if this change is made): https://github.com/thymeleaf/thymeleaf/issues/378 So hopefully, with a future version of Thymeleaf, all of this information will be useless and nothing more than of historical interest. Web Deploy is a great tool for deploying ASP.NET projects: it simplifies deployments, can target IIS 6 or 7, is pretty easy to get working on the server and the project side, and is supported by many hosting providers. It works really well when used along with continuous integration. In the first phase, the project is built and a Web Deploy package is made; the command used is (for example) “msbuild [something.sln or something.csproj or something.vbproj] /m /p:Configuration=release /p:DeployOnBuild=True /p:DeployTarget=Package /p:skipJsHint=true”. In the second phase, the Web Deploy package is deployed to servers for testing. One of the problems I noticed was that a user could browse around the site and hit a compilation error. For instance, if there was a misspelled variable in an ASPX page, the user would get a standard “500” error page. One of the purposes of continuous integration, and build/testing systems in general, is to avoid such problems. If the code behind fails to compile, the team is notified immediately – but if the ASPX page fails to compile, we have to wait for a user to report the problem. That is not acceptable. The aspnet_compiler tool is the solution to this problem. If you use ASP.NET MVC, your project’s MSBuild file will contain a target named “MVCBuildViews” that will run aspnet_compiler for you. Enabling the use of this target by setting the “MvcBuildViews” property makes the build take a bit longer, but there are less surprises – to me, the benefit far outweighs the cost. So the first option is to simply enable “MvcBuildViews.” “MVCBuildViews” writes the precompiled files to the ASP.NET temporary directory (the precompiled output is not included in the Web Deploy package), so they’ll be used only by the system that invoked the target (in my case, the continuous integration server). So for server deployments, you get the benefit of knowing that the pages compiled (solving the original problem), but you don’t get the other major benefit of precompiling – the startup performance boost. It turns that combining aspnet_compiler and Web Deploy is a bit tricky. I won’t go into the details, other than to say I figured it out and made an MSBuild target file that can be easily included into projects that use Web Deploy. Grab Precompile.targets and put it into the directory with your .csproj/.vbproj project file. Modify your .csproj or .vbproj file, add <Import Project=”$(MSBuildProjectDirectory)\Precompile.targets” /> towards the end of the file. In your project’s configuration, set the “AspNetCompiler” property to “true” for whatever configurations you want (I have it enabled for the “Release” configuration in my case). If you also want to invoke aspnet_merge, you need to ensure the system that does the building has Visual Studio or the Windows SDK installed, then in your project’s configuration, set the “AspNetMerge” property to “true” for whatever configurations you want. aspnet_merge is another interesting tool that merges assemblies. You can read about its benefits on the aspnet_merge MSDN page. I found that it is beneficial to use aspnet_merge almost always – the only problem I had was on one of my very large projects (with dozens of ASPX page and the total web site size being a few hundred megabytes), aspnet_merge took an exorbitantly long time. For example, on our normal project, it takes ~1 minute. On this very large project, it took over an hour. HTTP caching is both important, as it reduces bandwidth use and improves performance, and complex, as the rules are far from simple. In my experience, most Java and Android applications either don’t do HTTP caching, or they roll their own and up doing it wrong or in way too complicated a fashion. In other words, they create a non-standard, one off, unmaintainable solution. And IMHO, that’s no solution at all. If you find yourself using HttpClient, you can use HttpClient-Cache, which is an easy drop in for Java. See my previous post about HttpClient-Cache for Android. But if you’re using HttpUrlConnection (aka java.net.URL.openConnection()), there’s no good solution for regular Java or Android. Well, in Android 4.0 and later, you can use HttpResponseCache, but with only a small percentage of Android devices using 4.0 or later, that’s not a terribly good solution. If you use Android 4.0+’s HttpResponseCache as recommended by Google, then all previous Android versions end up with no HTTP response caching – this causes excess load on your servers, slower performance for the app, and unnecessary bandwidth use. To fix this problem, I grabbed all the code from AOSP that implements Android 4.0’s HttpResponseCache and made it a separate library. This library is easy to use, works on Java 1.5+, all versions of Android, and is licensed under APLv2 (just like everything else in AOSP). Really, there’s no reason not to use it! You can even use in Java server applications, such as those that use Spring. If you’re not using Maven, you’ll need to add the httpresponsecache jar and its dependency, disklrucache.jar, to your project. The source code to the library is available on GitHub. I’m already using it in my CallerID Android app. If you end up using this library, please leave me a comment. That’s it – enjoy easy to use HTTP caching! I’m using Visual Studio 2010, and the project targets .NET 3.5. The same approach would work fine if the project was targeting .NET 4.0. I’m using NuGet to manage dependencies. The first thing I did was add node-jshint as a dependency of the project. Add a new text file to the root of project called “jshintrc.json” If the file is included in the Visual Studio project, make sure the build action is “None” so Visual Studio doesn’t try to do anything with it. The file contents should look like this. The latest available version of node-json at this time, 0.5.5, doesn’t deal with a Byte Order Markers (BOM) in the jshintrc.json file, so when saving it, be sure the BOM isn’t included. Now whenever Visual Studio builds the project, JSHint errors will appear in the VS error list just like all other types of errors. It runs JSHint on all .js files included in your project as content (the way .js should be included in your project).